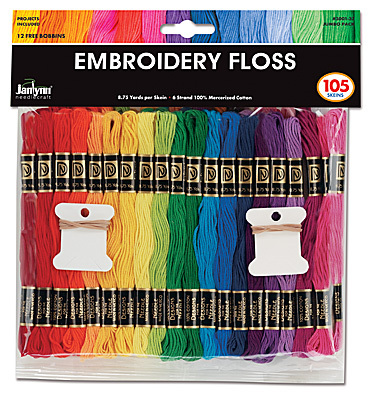 This 105 Skein Jumbo Floss Pack is the best floss value you'll ever see! You'll love working with these 100% Cotton Embroidery Floss Skeins because the quality is comparable to even the best known floss brand. This floss is so versatile in craft and needlework projects. We've even included a free floss project and 12 free bobbins with each pack. Each package contains 105 skeins of 8.75 yards (8 m) 6-strand 100% Cotton Floss in a variety of 37 great colors. Product of DFN, A Janlynn Company.